Very impressed with the newly launched selection of naturally gluten free gourmet flours and grains from Doves Farm. They come in handy tubes with the contents ranging in size from 110g to 150g depending on the product. The clever idea behind this being that you don't have to buy a huge pack of a slightly obscure ingredient. It can't just be me who buys something for one recipe which then languishes at the back of a cupboard until it's thrown out a year (or more!) later. 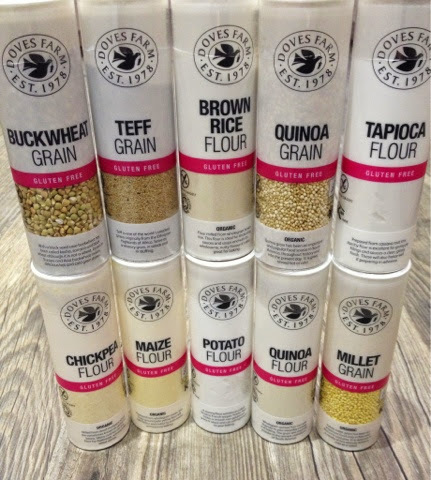 Each pack has a recipe on the back which has been developed by Clare Marriage, founder of Doves Farm, in her own kitchen. We tried out the Maize Flour Chocolate Crackle Cookies. 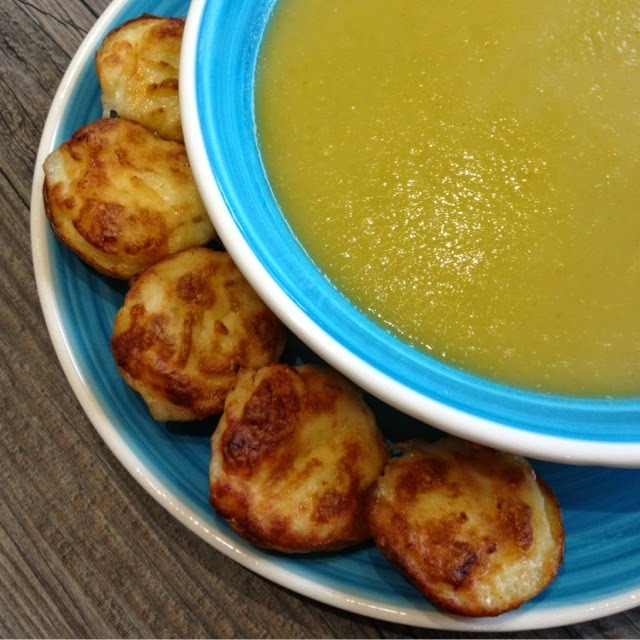 They were really tasty and my kids loved them as did a Coeliac colleague of Foodie Loon. I did have to add more flour and almonds to get the mixture to a rolling consistency and I also chilled it in the fridge. To flatten I used a fork which worked well. Looking forward to giving some of the other recipes a try. 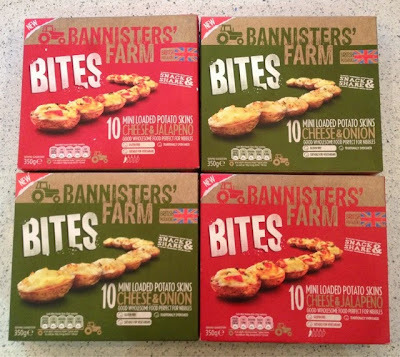 I've been working with the folks down on Bannisters' Farm to develop some #TermTimeTeatime recipes using their range of frozen baked potatoes, check them out here - Littl’uns Fajitas, Cheesy Beany Potato Hedgehogs and Tuna Niçoise Tatties. The latest addition to their range are Mini Bites. We tried the Cheese & Onion and the Cheese & Jalapeño but there's also a Cheese & Smoked Bacon which sounds even more up my street. They take 20 minutes to cook from frozen and we had them alongside some homemade Green Tomato Soup. 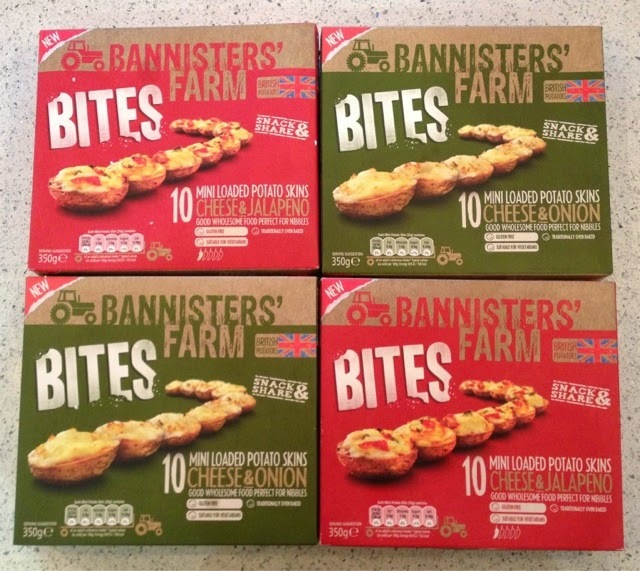 These would be a perfect standby to keep in the freezer particularly over the up coming festive period. Also fab as part of a snacky tea or for munchies whilst watching TV. There's a bit of a BBQ and Smoking revolution happening in Aberdeen at the moment. The latest addition to the burgeoning scene is a range of sauces from Angus & Oink. Three were delivered for me to try from the full range of six. We had the Pitboss BBQ on stir-fried beef served on a wrap with refried beans, green tomato salsa, soured cream and cheese. Really tasty. However I think I am way too much of a woose for the Phat Taco and Rampant Angus as they are seriously spicy. 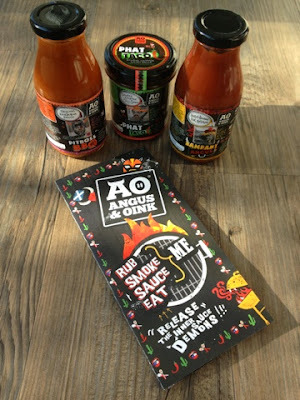 I passed them on to a friend who is a big chilli fan. She gave the ketchup the thumbs up but even for her the Phat Taco was burning hot. Definately to be used with caution. 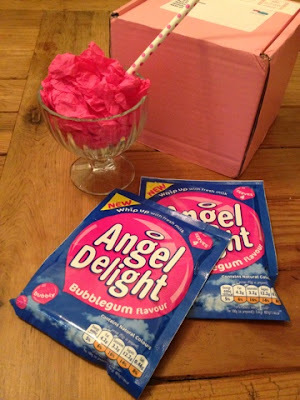 Someone in the household was very excited when a bright pink parcel arrived containing Bubblegum flavour Angel Delight, she even tried to convince me she should have it for breakfast. 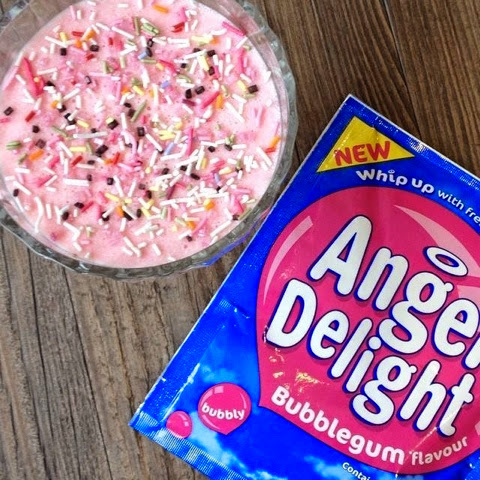 I'm not really an Angel Delight fan, although I'm sure I consumed my fair share as a child, however the three other members of the household are. Foodie Loon has a particular penchant for Butterscotch. When I posted on Twitter and Facebook there was an outpouring of nostalgia. Some had no idea that it was still available and there was a lot of love for Butterscotch. Apparently a concoction of Banana and Butterscotch is well worth a try. Alas the bubblegum flavour wasn't the one to convert me but it went down well with the kids who can't wait to try it as a milkshake. Surely no one has missed that fact that I've got a new kitchen? 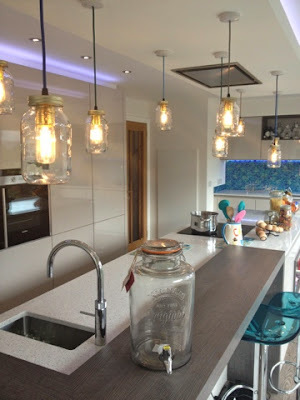 And I've got Jam Jar lights! The folk at Sliver Mushroom spotted them and sent me a matching Kilner Dispenser to review. Doesn't it look amazing in situ? Alas I've not had a chance to try it out with anything bar soft drinks but it will have pride of place when filled with something stronger at my kitchen warming party. I asked for suggestions on Facebook for what I should fill it with and the resounding answer was Gin. I guess my paunchent for Mothers Ruin is weel kent. Unfortunately it's not suitable for hot drinks which is a wee bit disappointing as it rules out Mulled Wine. It would however be the perfect Pimm's receptacle come summer time. My only other wee gripe is that you have to unclip the lid when its in use. However I can forgive that wee quirk as it looks so fab. 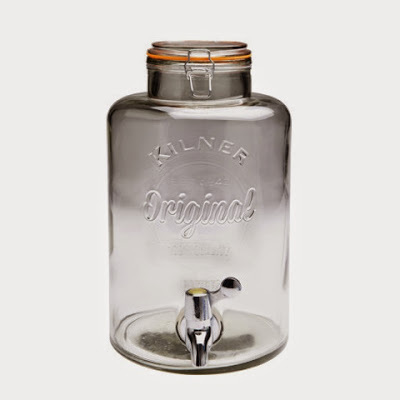 There's a huge range of gorgeous Kilner products on the Silver Mushroom site. My jam jar wish list is getting longer! It's beginning to look a lot like Christmas! 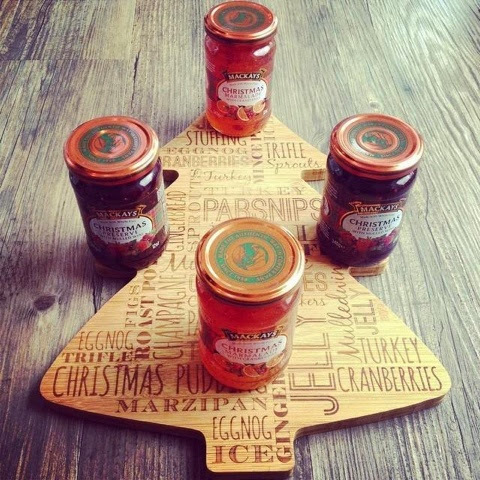 Two new preserves have been launched by MacKays for the festive season. 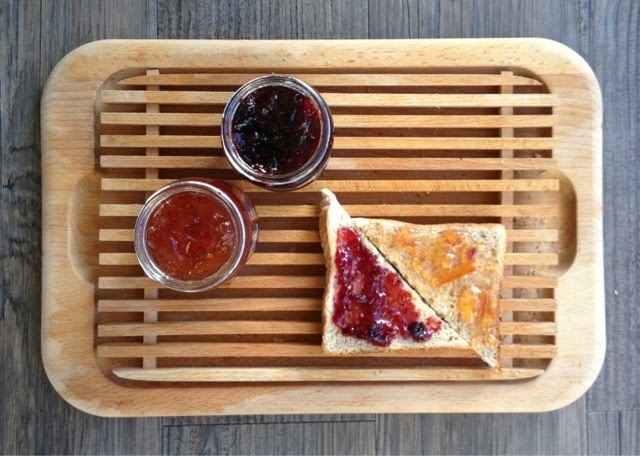 Christmas Marmalade with Cranberries and Christmas Preserve with Mulled Wine. As I was dishing up my tale of two toasts for breakfast, girl came along for a sniff and declared that they both smelled of gingerbread. Job done! 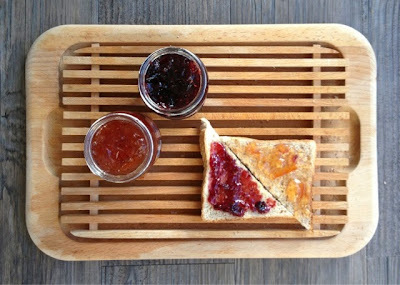 They do indeed both have a fantasticly spicy festive aroma about them and are jam packed full of fruit. 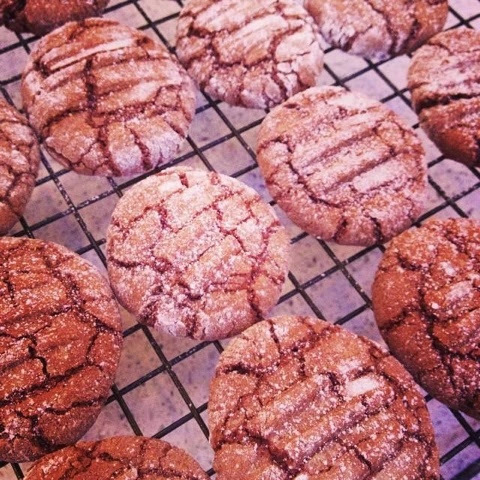 I reckon they would make a great seasonal gift and will also be perfect to use in Christmas baking. I've already got a few ideas up my sleeve of ways in which I can use them. The timing couldn't have been better for the delivery of the Good Grips 2 piece Fruit Scoop Set. 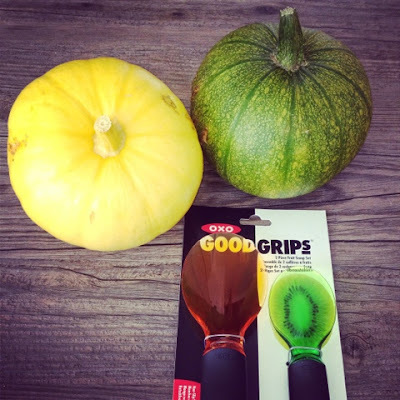 I excitably posted on Facebook saying that I couldn't wait to try them to scoop out a pumpkin only to be told that they looked like nothing more than coloured plastic spoons. I'm happy to report that they were much more and were great for scooping out both hard and soft fruits. The good grips handle makes them comfortable to use even when excerting pressure and the edges are sharp enough to cut. They made swift work of both kiwi and avocado. Really impressed with these. I've previously blogged all about the innovative Coast and Glen Fish Box scheme and was delighted to be sent a further box brimming with shellfish. 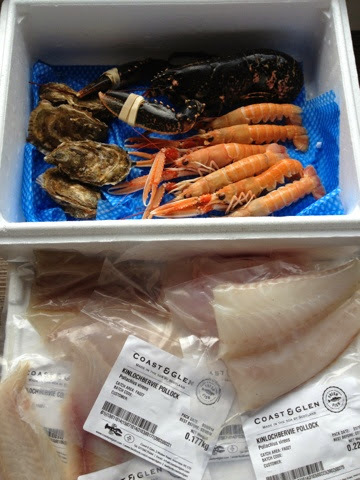 The Lobster was landed in Cromarty by Willie, Langoustines caught by Murdo at Kyle of Lochalsh and Oysters from the Isle of Bute. Can't get better provenance than that! 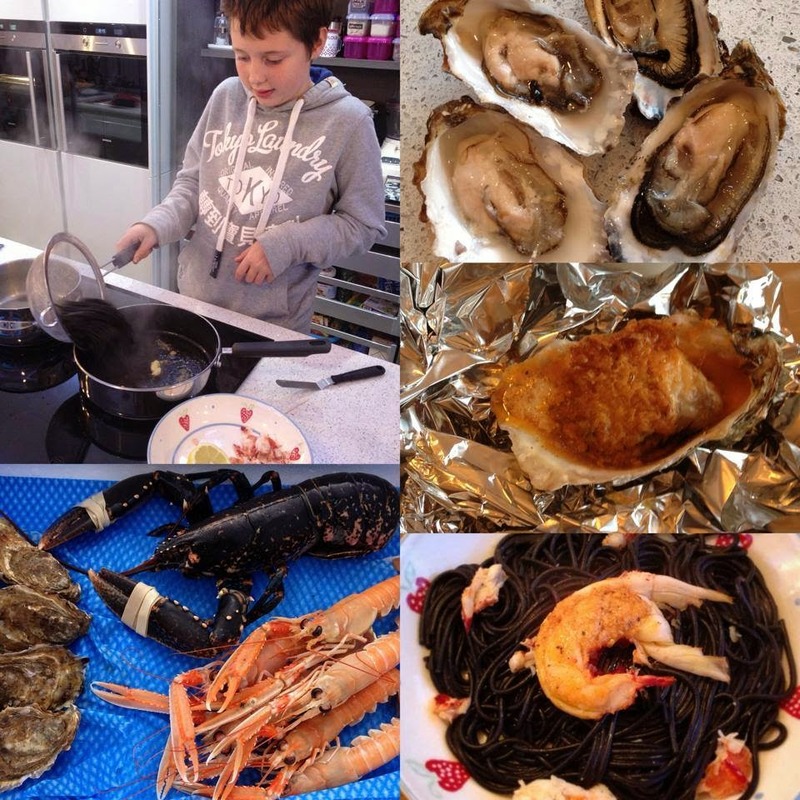 Foodie boy was charged with cooking dinner and created a fantastic meal of Grilled Oysters with smoked paprika, garlic, lemon and Parmesan butter followed by Spaghetti Nero with Langoustines and Lobster. 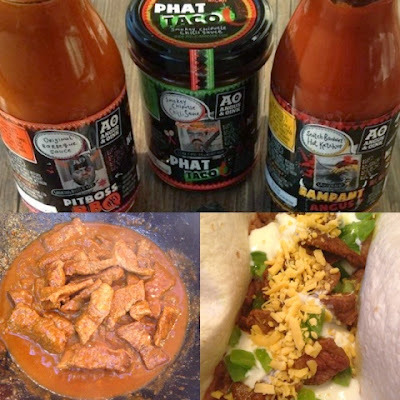 Disclosure : Thanks to Doves Farm, Bannisters' Farm, Angus & Oink, Angel Delight, Silver Mushroom, MacKays Jam, OXO UK and Coast & Glen for providing the above products. I was not obliged to review positively in return. All views expressed are my own.